Welcome to “K Cups 4 Classrooms”! In January 2015 we started saving K Cups and have since found many incredible ways to repurpose them! 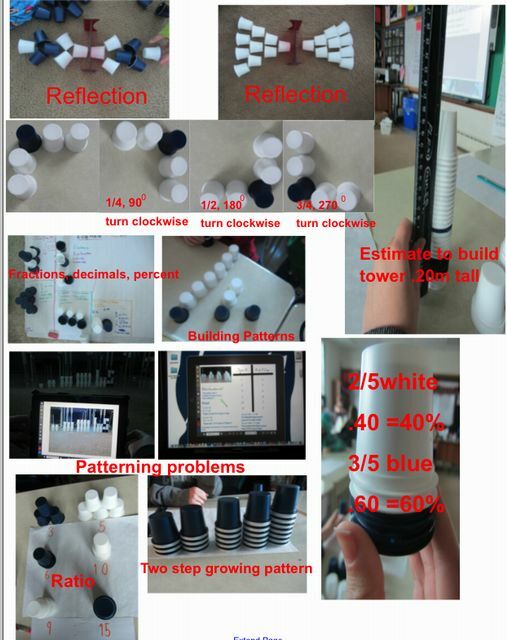 See our Ideas for K Cups in the Classroom Page for a wealth of ideas, lessons and resources, check out our cool video and visit the K Cups Math Resource Page for great lessons that will make learning math fun, tangible, relevant and engaging! We made CBC NATIONAL NEWS and AS IT HAPPENS and OWL Magazine! 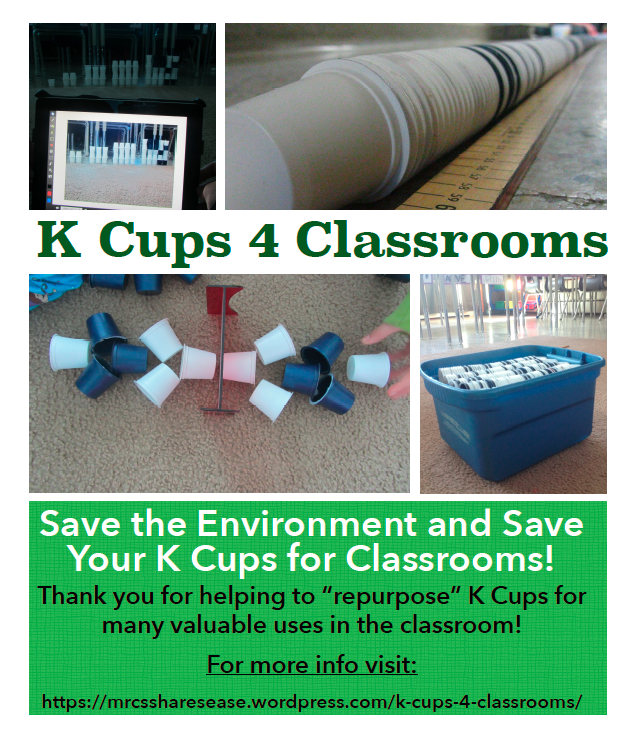 We are happy that teachers and students throughout the world have followed our lead and began to repurpose K Cups as well! To get you started saving we have provided a downloadable letter to parents K Cups for Classrooms letter PDF and a poster K Cups 4 Classrooms Poster to promote saving K Cups for classroom use. Our goal is to have 1 000 teachers/schools save and repurpose 1 000 000 K Cups! 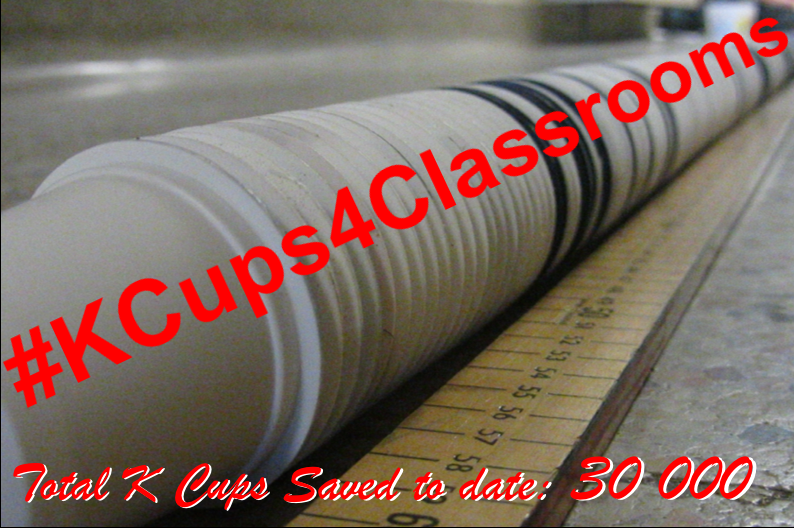 Please leave your class/school name, city and country in the REPLY section at the very bottom of this page, email me pcameron@tbcdsb.on.ca or tweet to #KCups4Classrooms if you plan on saving and using K Cups in your classroom/school! As you begin to accumulate K Cups please share your totals and we’ll add to the TOTAL K CUPS saved tally! Mrs. Dillard’s Grade 7-9’s Creative Problem Solving and GATE Classes- Sage Valley Junior High, Gillette, Wyoming, USA. Mrs. Oltman’s 6th grade science at Kittredge Magnet School – Atlanta GA, USA is in for the million k-cup challenge! Ms Lewis-Young’s 3B Massey Street PS Brampton ON, CANADA We are in! Mr. Turner’s grade 5 class St. Vincent Thunder Bay ON, Canada We are in!!! Mrs. Garieri’s and Ms. Timko’s grade 6 classes at Holy Family School in Thunder Bay, On, Canada We are in!!! Mrs. Barch’s Grade 6 class is always up for a great challenge! St. Elizabeth School, Thunder Bay, Canada! Mr. Seigel’s Chemistry classes Middletown High School South Middletown, NJ, USA Sign me up! Ms. Ferriolo’s Grade 5 Class from Dryden, ON just started collecting! So far we only have 2 but are on a mission to collect a lot more! Mrs. Ross Grade 5 My grade 5 class will start in Calgary, Alberta! A great environmental and math solution. I am originally from Thunder Bay, so nice to hear my hometown cares!! Thanks for taking the initiative! Ms. Hyatt’s grade 4 class from Dryden, Ont has joined the challenge! Mrs. Evershed’s Grade 7 Class from Earnscliffe SPS in Brampton Ontario. We are excited! Mme Potter’s grade 3 and school eco-kids club at St.Bernard School in Thunder Bay, Ontario have collected, cleaned and repurposed 1427 k-cups so far and still going! This has been such a fun challenge so far! Ms Rosnow’s Grade 3 class at St Francis School in Thunder Bay, ON has joined! Great initiative! PS We are from Resurrection Catholic School! Going to try this in Muskego Wisconsin-3rd grade classroom! I needed to find some cool projects and this is one of them! Thanks for sharing.. 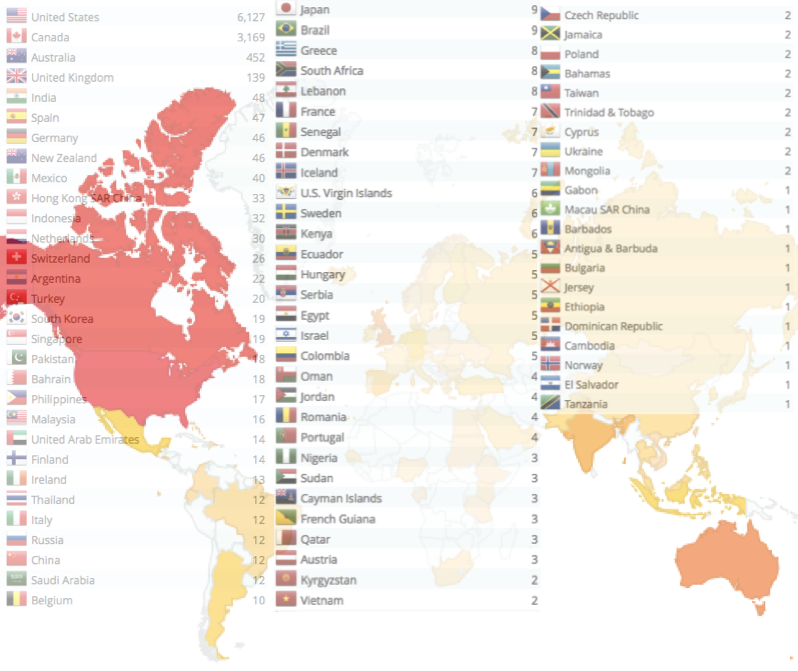 I am going to take a few more of your ideas-too! Mrs. Lucciantonio’s 3/4 class and Ms. Fay’s Grade 1/2 FI class just started collecting K-cups. We are at Holy Cross Catholic School in Sudbury, Ontario. 6 so far!!! We are on our way. You can count Centralia Junior High School from Centralia, Illinois, USA as a new K-cup school.